Forever alone.. Being a pu’erh addict in the west is a lonely endeavor and how we intake information and buy tea is in all likelihood very different than the average Asian pu-head. We’re often resigned to the tea table/closet all by our self. If we’re lucky we can get a good friend/significant other to come over once a month to humor us but we’re mainly drinking alone and talking to each other on instagram.. It’s no wonder why teapets are so popular.. In the western tea scene… 65ml teapots are in high-demand. In the western tea scene… we get teeny, tiny boxes of tea shipped monthly. In the western tea scene… a cake is most definitely not a sample. In the western tea scene… we occasionally indulge with **gasp** multiple 200g cakes that we we still have trouble getting through! It might be delicious tea, but it’s more often than not a very solitary hobby. On the plus side, drinking by yourself or with a few third parties is helpful because it removes the sense of urgency and sales. You can drink as you please, have control over the water, and have the power to create consistent brewing. It’s for the most part a safe place. Out east in places with a longer history of pu’erh consumption or a thriving tea community it’s a bit different. As covered extensively by Marshaln, both Hong Kong and Taiwan have very different teashop scenes. There’s some surface level similarities.. For instance, in both places you sit down and try tea. It’s usually served by someone from the store, except for the odd exception like Wistaria. Frequently this will be the owner, but for larger shops it could also be an employee. At the end of the session, you can choose to buy tea in some quantity to take home. None of the, I’m going to buy 25 grams and drink it over the next three months and then dilly dally for another three months before picking up a 250 gram cake that’s very common in the west.. The people that own the shop might be tea folks, but they’re also definitely sales. There’s varying degrees of pressure put on you, depending on the shop and the circumstances. Even when there’s not a hard sell, there’s still a social sense of reciprocation to return the favor in some fashion (they just let you try tea!).. I’ve had experiences in more than a few teashops with a similar structure in the US. I hardly ever go anywhere local anymore because it’s not my preferred mode of buying tea and generally feel I can do just as well buying online and avoid much of the pressure. In the west it’s also a very small market selling to locals and the prices are usually higher compared to what’s available online (a storefront isn’t cheap). It’s nice to drink tea with others especially if you have a shared interest but drinking at a teashop also usually requires some mental preparation on the tea drinkers part to be able to say no towards buying teas. It’s not the end of the world, but I have ended up regretting a few small purchases early on in my tea hobby. I’m buying pu’erh and pu’erh only. I’m aiming for more mature pu’erh or traditionally stored pu’erh (esp. in HK). I’m not aiming for premium tea. #1. I’m buying pu’erh and pu’erh only. Alright, so I went to the island of tea that grows amazing oolongs and is also a hotbed for aged oolong. Yet the only tea I sought out was pu’erh. Why? Cause that’s what has my interest now damnit. I had only two weeks in these countries, making time a finite resource. Oolongs don’t generate as much interest as they once did and I haven’t even started consuming the box (aged oolongs). #2. I’d like to buy some traditionally stored or more mature pu’erh. The western market is biased against these teas, and the western market pretty lacking. There are far more options in both Taipei and Hong Kong. Aged tea in the online market also tends to be $$$, a good deal more than it is in Asia. I don’t really blame western vendors as they basically are resellers. Most don’t have long-standing stocks of tea that they acquired pre-2000s. Throughout its unfortunately short existence, I was a big fan and consumer of Origin Tea. Functional, relatively mature teas for a fair $$ with access to a wide array of teas available in Taiwan. Had Tony’s business stayed open for even another year, he likely would’ve ended up with an obscene amount of my $$. Hell, I’m even spending lots of my $$ on YangQing Hao he used to sell these days. #3. I’m not aiming for too premium of tea. Why?? Some of my tea friends have questioned this. The tea’s there and I’m willing to spend money. So why hold back? First of all I wasn’t swimming with time. I also want to dip my toes in a bit before diving in. In TwoDog’s now famous buying tenets, tenet one (comes before three) is basically to generally know what the hell you’re doing. While I feel I’m getting there within my usual routine, adding in additional complexity like an unfamiliar continent and unfamiliar shops is far from my safe place. There were a few shops that offered me the opportunity to buy some especially nice tea (>$/g++) tea but in the end I declined largely for the above reason. In an unfamiliar tea buying context, I decided it’s too easy to make a mistake by impulse buying. I’d rather keep the stakes low for now. In the end this isn’t too hard as most shops treated me as a foreigner (at the start) and would start the price barrier low. Of course it was Wistaria. Trip #1. The preface… We took a 2AM flight out of Seattle and arrived in Taipei very early in the morning. Turns out there isn’t much to do at Taipei at 6AM and we were immediately reduced to googling what the heck to do. We walked around and went to a western-fashioned coffee shop that seemed to be the only thing open. Two women were there. One was eating a whole freaking pizza. Welcome back to Asia! We wandered into Wistaria at around 10AM, a little after they opened. Wistaria is a cool place and easily the most accessible place for casual drinkers traveling to Taipei. You can probably recommend this to your Aunt Sally and she’d enjoy the experience. Their setup is slightly confusing but we ended up drinking the Zipin (Yiwu) and Ziyin (Nannuo) with bits to take home. Wistaria has ambiance down.. It’s a calm, relaxing spot that has a pond out front and some private rooms out back. Service is slow, but none of us really minded. We’d unloaded our luggage at the hostel, and Wistaria offered us some much needed caffeine to power through the day, fight jet lag and fully adjust. When we ordered pu’erh off the English menu they seemed surprised and asked if we were sure. Yes we were sure..
After that, you’re basically given a tea tray with a pot, cha hai, ceramic kettle (filled to the brim with water) and a various array of utensils. How was the tea? Drinking tea after a cross-ocean flight is probably not exactly the best time to evaluate tea, but both teas were clearly good. Given my predisposition towards Yiwu teas I was expecting to like the Zipin more but actually ended up gravitating more towards the Ziyin. After we finished up and were paying the bill, I inquired about a few of the prices on whole Wistaria cakes. The Zipin was going for 6500 NTD, Ziyin for 5800 NTD, the 2006 Banzhang at 13500 NTD (I think). Current conversation rate: 1USD = 32.50NTD. This puts Zipin right around $200USD, the Ziyin at $175, and the Banzhang at $400+. Note: About that 6AM Pizza.. One of my favorite things about Asia is seeing the takes on western things. They’re sometimes clever or cool, and are frequently hilarious. Yes I did eat a curry hamburger hotdog from Burger King in the Taoyuan Airport on the way back. Trip #2. This was at the end of the trip. Had a group of four again. MS, JF, and ZM. Because MS was curious about their Wuyis we started with the aged Shuixian. We then followed that with the 2006 Banzhang and a 1960s tea off their normal menu. The aged Shuixian was a decent tea, albeit no frills. Everyone enjoyed it and it went for a surprising number of infusions, at least for a Shuixian. MS inquired about the price but didn’t end up buying (I forget the specifics). The Banzhang was up next. The table was split on this one. We’d gone a little before lunchtime and ZM had just flown in this morning. At least an hour had passed and it was nearly 1PM. In retrospect it probably wasn’t the best tea to choose given that Wistaria takes their time with service. Tony (Origin) told me when I returned that this wasn’t produced by Zhou Yu, but purchased later. No idea when he bought up his batch but the storage is clearly different from the Zipin and Ziyin.. JF and ZM found the tea to be too strong, with both tapping out at around the fourth or fifth infusion. MS on the other hand really enjoyed it. I also enjoyed aspects of the tea but don’t think I’d pay anything close to the $400USD being asked. Since we were the only two drinking we drank through a good amount of tea before moving on.. The 1960s pu’erh falls into the cheap for a reason category of aged teas. It was on their normal menu and I believe it was caked. It’s an OK tea viewed outside of the “OMG it’s 50 years old” context but isn’t anything special. A bit wet at the start, but once you rinse/drink through the first few steeps it’s smooth and sweet. Brews out for a long while. MS hated the tea and found it undrinkable. JF, ZM, and myself chugged through a bunch of it, arrived at similar conclusions and then left for lunch. The stamp collector in me wanted a Wistaria cake, and I’d promised a tea friend I’d pick up a couple cakes back in the states (hope you enjoy em!). Since the Ziyin hit a chord with me and with a whole array of Yangqing Hao available, I opted for that tea. There’s quite a few teas I didn’t get a chance to try (2007 Hongyin/Lanyin, Taihe, 2003 Qingteng, etc.) so I wasn’t choosing off of a coordinated tasting. While it may’ve been suboptimal, given the lack of decent Menghai area tea and my growing stockpile of Yiwu tea I don’t think I’ll regret my decision too much. Note: We also looked at the special menu with expensive teas. We’d been using the Translate App to help read stuff. You basically take a picture and it translates it. Very useful app. The special menu is in fancy hand-written Chinese that Translate is basically incapable of reading. Not sure what it said, but it was presumably expensive and old tea. The most expensive one is an aged Hongyin (50s, 60s?). Wistaria menu. Off-shelf (expensive) stuff on right. Maokong is an area that used to be one of the primary tea-growing areas in Taiwan. It’s now more of a tourist area, but there’s still a little tea grown. It’s a short trip from the city center and is a fun day trip. 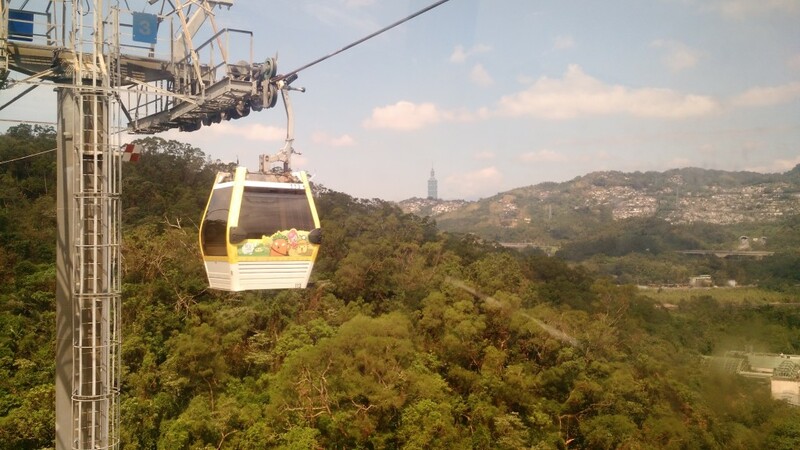 You take the Brown Subway line (Wenshan) to the end and then it’s a 30 minute Gondola ride up. From there you can walk around and explore the area. There’s lots of tourists around, which also makes it a relatively easy area to navigate. MS, JF, DW, and myself went here on our third or fourth day in Taipei. I’d been told that it doesn’t really have too much serious tea, something I found to be more or less the case. We walked into a strange memorial/museum that turned out to be mainly just a tea shop. They had a bunch of pu’erh cakes in the back, but I wanted my friends to get a taste of Taiwanese tea while we were up here. We tasted a couple different darker Taiwanese Tieguanyin (the gondola stop is one stop past Muzha) and some supposedly Alishan. They were all about average by my estimations. Prices were about 40-50% of what you’d pay online in the west. I didn’t buy anything, but MS bought a small bag of Tieguanyin. DW and JF both bought small bags of the Alishan we tried. We walked around a bit more before landing at another tea house with a gorgeous view and truly awful green tea that was probably from Vietnam before heading back. Note: The memorial/tea shop is the same as this TC thread. This was the first day full of tea shopping. I’d told my friends they didn’t really have to come, but everyone seemed interested in coming along. We had some very satisfying beef noodle soup from Yongkang Beef Noodles near the train station and then walked around the neighborhood. We briefly wandered into Lin’s Ceramics and drank a cup of Alishan before heading down further down Yongkang. This shop was near the bottom of Yongkang street and specialized in pu’erh, with lots of Dayi (both old and young) on display. The shop was small and cramped but filled to the brim with eye-candy (pu’erh and pots). We walked in on a guy chatting with the owner. Being an armada of four, I felt a bit bad/rude about showing up as we did and the guy ended up exiting fairly quickly.. I was concerned about language barriers but we were able to communicate well enough with her in English. The first tea we tried was a chunky, 500 gram 1998 Yiwu Brick. It’s got the same wrapper as the one sold by Camellia Sinensis. Cleanly stored tea it was pretty clear from the get-go that the Bazhong I’d been brewing at the hostel was a poor comparison due to its murkier pedigree. That being said, the tea was nice. It was a very smooth, lightly camphorated experience that hit the back of my mouth/throat. It’s not the best material but at $0.25/g I’ll take that over its competition. MS had been eyeing a couple aged oolongs sitting on her table and asked to try one. She let us pick and the group picked the more aromatic one. She estimated the age at about 25-30 years old. It started out a bit sour before gravitating towards that sweet plum flavor that I associate and love in aged oolongs. It was a bit light in comparison to the teas we were drinking but decent enough. We finished on a 2005 Xiaguan brick which was smoky and rough especially at the start. It smoothed out later but was pretty meh overall (it was appropriately cheap).. I picked up a pair of the Yiwu bricks for 3800NTD apiece (~$117).. Drinking it since I got back I’m very satisfied and kinda feel like I should’ve stopped by again and drank through more teas.. There were also lots of really nice factory 1 pots that looked legit.. I’ve done my best to curtail all teaware and covered my eyes to the best of my ability. If you are an yixing lover DO NOT READ what’s ahead… While I wasn’t in the market for pots, MS was. He basically wanted something big and cheap to brew Wuyi oolongs at work. This became apparent when the shop owner showed her own pot recommendations for yancha. These were some really nice looking pots that were small. He balked at both the price and the size, taking home the largest, cheapest pot she sold (something like 1000NTD). While this probably makes a few of us cringe, he’s since reported that he’s quite satisfied with the pot. Note: A brief word on etiquette.. While drinking the aged oolong, the tea shop owner let out an enormous belch.. As many of you know, tea and pu’erh have a tendency to cleanse the body. Belching is standard and perfectly OK etiquette. Duly noted. After teashop #4 we walked around and walked into another shop a few blocks away. MS’ tea of choice is typically wuyi oolongs. Unlike the cramped, homely nature of shop #4 this shop was more open and modern. MS has very particular taste and the first one (by my tastes the nicest) was not to his liking. It was supposedly from 2010 and had a developing sweet plum taste. Alas we moved on quickly after it became clear he didn’t like it.. We ended up drinking through a whole ton of teas there. Most of it was oolong, a couple different Wuyis, some Taiwanese Hong Shui. When they found out I was interested in pu’erh they brewed up a cooked brick the owner had supposedly pressed. It was just $20, but was pretty wet and subpar. Oh well.. MS left with a few bags of Hong Shui and a pair of Wuyis and we called it a day. This was a shop that despite having their display littered with various pu’erh specialized in Yancha. I suspect they catered towards the higher-end as nearly everything was at least 5-10 years old and the cheapest was $30/100g. MS told the shop owner that he wanted to try Wuyi. There was one customer already seated there. Both him and the shop owner seemed surprised but pleased as it’s apparently an odd request especially from a tourist/foreigner. The tea we had was quite good despite trying mainly tea from their lower tier offerings. The two teas were a 2005 Shuixian and 2010 Dahongpao (I think?). Both were decent enough, with the Dahongpao being clearly heavier and a little less smooth with still some of the roast. We mentioned that we’d been to Maokong recently and they laughed at the quality of tea there, saying nearly all of it is from Vietnam and the owner subsequently offered to brew up his best Taiwanese oolong, a Lishan. The customer did the sales job talking up the tea and the shop, and how it was the best in Taiwan. By my estimates, it was very good and clearly better than all the tea we’d had on Maokong, not that that really says anything. Me not being remotely calibrated to gaoshan can’t really confirm or deny that it was truly higher-tier stuff but it was at least very enjoyable and held up well against the Yancha. JF and DW in particular liked it, and despite his prejudice against green oolongs, MS begrudgingly complimented it. The other customer left and the shop owner then reached back and pulled out a non-descript tea from what was a huge plastic bag. He said we were drinking this for himself (it wasn’t for sale) and it turned out to be a Wuyi supposedly from the 1970s. It was a bit broken up and only had a slight smell to it. The tea had hardly any flavor, but it was silky-smooth and it simply felt great. After consuming four or five teas it’s hardly an unbiased space to evaluate qi when you’re on your 6th tea of the day, but this one was very grounding. We drank in near silence. MS didn’t like it at all and had started declining cups. After we left we finally discussed the tea.. DW and I loved this, but it also wasn’t quite unanimous. The shop owner said he didn’t like to drink Taiwanese oolongs and any pu’erh younger than the late 1990s. Amusingly, this pretty much composed the entirety of his teas on display in his store. Gotta cater to the market! Note: JF’s favorite tea of Taiwan ended up being the Lishan we had. Two quick hits with JF and MS. Visited these at around 7:30PM while browsing through Taipei. We’d planned on going to see the Martian in a very unusual and swank theater at 10PM and had some time to kill. The first shop we went into had a bunch of random wrappers that I didn’t recognize.. After some difficulty communicating between raw and ripe, they told us that they were closing up for the night and gave us a sample of some 2005 tea to try. Whelp it was a terrible tea, and we never came back..
We wandered into shop #8 about a block away. There was a girl whose parents owned the shop holding fort there. In the shop’s interior there was a large collection of pu’erh on the wall, mainly older Menghai (aren’t they all?). We tried a pair of teas from ~2000. It was clear I was the buyer and she had a tendency to stare intensely as I drank. This made me a little uncomfortable and I had a hard time getting a solid grasp on the teas. They were a little cleaner/drier than the Bazhong I’d brought along, but neither really struck much of a chord with me. This isn’t a very good sign as the Bazhong is more of a daily drinker than a ribbon winner and any tea I was going to buy, should do well in comparison. MS then asked to try their Wuyi which turned out to be the sort of Wuyi you’d expect from a shop that doesn’t specialize it. Heavily roasted and generic. We went into this shop, nearby shop #7 and #8. The guy spoke English very well and had apparently been to the US during the summer to buy up art and bring it back to Asia. This ended up being one of our longest teashop visits. Supposedly the owner had been transitioning from the tea business into art dealing. The rest of his family was still in the tea business so he still was somewhat stocked..
We started with the 2005 Mengku Spring Tips. This was decent and smooth but pretty unexciting for me. JF and MS both really liked it and it’s easy to see why.. Friendly tea with a lot of flavor and not too much bitterness. This is an area of tea where I’m particularly overstocked.. Next up was a Xiaguan tuo from 2004 that was generally rougher. We moved on quickly to other teas..
Next up was some sort of heicha supposedly from the 1970s (for Tibet or from Tibet). The leaves were extremely fluffy and he brewed it in a giant pot. It was smooth, clean, mellow, and had a lotus aroma/taste, and gave a nice buzzy mouthfeel. MS wouldn’t go near the stuff after the first cup but the rest of us enjoyed it. On that note, I tried to figure out what was up with these owners brewing these nice old teas that aren’t for sale. The cynic in me definitely is suspicious of a sales angle? Perhaps some sort of reciprocation tactic, making you feel more obligated to buy? The optimist would simply say that they’re treating us foreigners and perhaps there is some truth in that. We finished up with a supposedly 2000 Yiwu brick (250g), selling for 2000NTD. This was my favorite of the lot. It was a bit less in the mouth but had a smoother form. A good example of Yiwu and I ended up bringing home a couple. The 1998 Yiwu might’ve been the better buy, but it was hard for me to determine without a direct comparison. More on HK in another overlong post. This entry was posted in Aged Pu'erh, Article, Drinking Report, High-Mountain Oolong, Long-form Article, Low-Elevation Oolong, Oolong, Raw Pu'erh, Taiwanese Oolong, Wuyi Oolong. Bookmark the permalink. The few remaining 茶藝館 in Taipei, Wisteria being one of them, use a small candle to heat the water kettle. Doesn’t cut it for Pu’er, at least not for me. Pinglin is worth a visit for nice 包種茶, which to my mind is underrated. There are a couple shops there where you can drink prize-winning包種 without pressure to buy. And also where you can find some very nice aged Pu’er cakes/bricks tucked away in a cabinet. Note: You do need to be able to speak Mandarin (or Minnan). I used to use the glass kettles they use and come out with bad results as well. But I remember hearing they actually heat the water in high fire, as Zhou Yu prefers water heated fast. From my experience in Asia those candles are normally used after or just before the boiling point has been reached elsewhere. Isn’t it so there as well? Thanks for the notes. I’ll need to pay Pinglin a visit next time. Puyuan, yep. You’re exactly right. It’s definitely delivered at a boil or just off of it. The candle is just to keep it warm. I didn’t have an issue with it, but I could see how someone might if they’re drinking slowly or are in a smaller party. They supposedly do ‘boil’ the water prior to delivering it to you (I actually prefer that my tea water never be aggressively boiled). Either way, the candle is useless for keeping the water adequately hot for a long Pu’er session of multiple infusions. In the ‘old days’, when ‘chayi’ shops were aplenty in Taipei, they typically gave you an electric kettle, with which you could better control your water. The remaining few shops, today, shoot for ambience. Hence the candle. The tea is so consistently underwhelming in these ambience shops (like Wisteria) that I’m probably just being nostalgic in demanding ‘hot’ water. In any case, in these ambience shops, it’s best to stick with ‘light’ oolongs, like baozhong, where the water doesn’t need to be so hot to properly infuse the tea. I’ll also add that we never got glass kettles, always had big ceramic ones that are similar to Lin’s. The water felt as if it was off of a boil. Interesting on the ceramic kettles. I’m just back from Taipei (and Xiamen) but I didn’t visit Wisteria on this trip. Though I’ve been there many times over the years, beginning in the late 1990’s, I can’t recall what kind of kettle they offered. My memory is scrambled by too many hours in too many tea shops all over China and Taiwan. In Taipei, I no longer spend much time in 茶藝館。Just not worth it. There aren’t even many 茶莊 in which it’s worthwhile to hang out and brew/talk tea. These days the Mainland is far more interesting and exciting for tea hunting, in part because it’s also quite ‘complicated’. One 茶藝館 I did visit in Taipei on this trip was just off 永康街. The ambience was lovely. It was very quiet. I wanted to do some reading while brewing/sipping tea. Perfect. They used a glass kettle on a candle. I splurged for a pricey 六安 that they told me was ‘very old’ and from the owner’s private collection. After one sip I was quite sure it was young and unexceptional, the same insipid stuff found in the baskets now popping up in shops all over China (who knows if they’re even from 安徽). I politely imparted to them my ‘opinion’. At checkout, they told me they had grabbed the wrong bag of 六安 and took a nice chunk off my bill, which was nice of them. To ramble further: I visited a 茶莊, also in the 永康 neighborhood, specializing in 凍頂. The owner was away; his sister was my host. We had a nice chat about tea, about change in Taiwan, about life in general. I tried 4 different 凍頂’s during the 2+ hour session, from lighter to darker. I told her honestly that not a one of them hit the 凍頂 taste that I am familiar with. She gave me a free sample of an ointment that had come up at one point in our meandering conversation. As I deliberated which of the teas I should by a tiny bit of as polite gesture, she insisted that I don’t buy any. In other words, she knew none of the teas was a ‘true’ or ‘worthy’ 凍頂 and she knew that I knew it too. A very nice lady. These two episodes from my recent visit to Taipei are par for the course today. And I could go on…. Thanks for the tales of tea hunting.. I must say, I’m quite excited to get back out there. Felt like a good deal more to discover with not nearly enough time. The mainland sounds like a whole other sort of adventure that I look forward to and fear at the same time. Very nice post. Did you have to bargain prices? How did that work? The impression I get is that it’s somewhat shop-dependent. I assumed you would not be able to negotiate at Wistaria, but a few others you might be able to get small discounts. I had somewhat similar experience in Hong Kong. I got small discounts there, but never anything above 10-15% . Quite different from mainland China, where negotiation is closer to a requirement. There are others with far more experience than myself, so I’d also listen to others that chime in. James is spot on here. Minimal to no bargaining in Taiwan, and even less so generally in HK (for retail sales). I can typically finagle some discount in Taiwan, but it’s not usually large. The Mainland, on the other hand, is all about bargaining. It’s not unusual to be able to cut a retail price in half. Sometimes I stretch bargaining for one tea in one shop over a couple weeks. ‘Be creative’ and ‘thick-skinned’ and ‘persistent’, would be my advice. I spent 3+ months ‘working’ the mind-bogglingly magnificent 馬連道, Beijing’s wholesale tea district with upwards of 7,000 tea shops. I literally became addicted to hunting and bargaining for ‘my teas’ there everyday. Thanks for that. Very useful post. Oozing Pu with pleasure with this wonderful Saturday read. Enjoyed this walk alongside your Taiwan trip! Haha. I’m not a teaware addict like the rest of y’all! Thank you James for sharing the details of your travels. This read was quite entertaining and informative. It’s like reading an adventure story for those who aspire to reach the tea lands some day. Additional thanks to Paul for sharing snippets of his travels. These are the kinds of stories that would be most enjoyable over a cuppa, or a lengthy Pu’ session. Thanks for the comment Joshua! Glad you enjoyed it :). Great post! I loved reading this. I am back home in the US for the holidays and this post made me miss Taiwan so bad. How was the Yongkang Beef Noodles? I’ve never been there, since it’s a bit expensive and I always cheap out at the last moment. But I’ve heard it’s one of the best places in Taipei. I moved to Taiwan this year, so I know many of the stores you are referring to. The little puerh shop at the end of Yongkang is one of my favorites. That is my go-to place for any puerh purchase. I’m very happy that you found it, since it’s pretty nondescript and easy to miss. I love going to teashops to hang out and talk while brewing some nice tea. But I generally bring my own tea, since it’s a lot cheaper (you just have to pay the “water fee”) and I know what I am drinking. But if I go to certain tea shops, like Wistaria, I will usually buy their tea since I know it is good. If you stop by Taiwan again, let me know. I can assemble a meeting of the “Taipei Tea People” that I hang out with, mostly people that own small tea companies or people that make teawares and things. We usually meet up every so often and go somewhere to share teas and geek out a bit. I know we would enjoy your company. Thanks for the comment. I’m quite jealous, you being in Taiwan and all. You must be used to TW prices :). Yongkang Beef Noodles was 250NTD for the standard beef noodles ($7.50). Not cheap (I guess?) but not expensive by my spendy, American standards. I’ll probably be back in Taiwan for a longer stay in April/May. Sounds like great fun and I appreciate your offer. Will shoot you a message for sure! 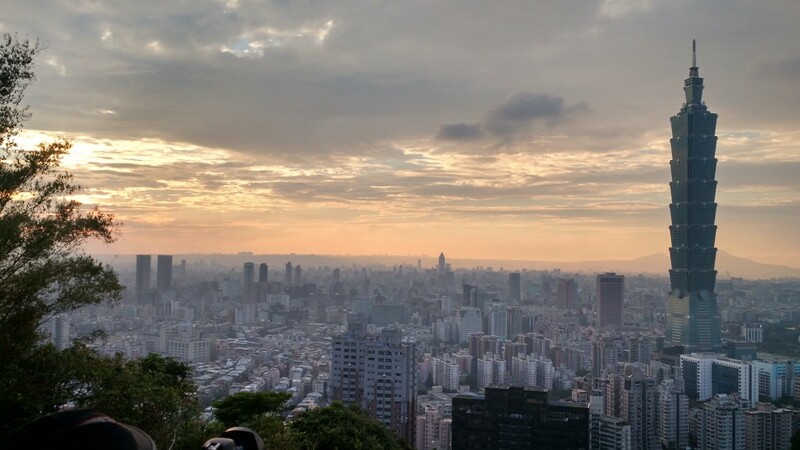 I love eating in taipei, I was back over there during the last week of December myself. I was not wowed by any of the beef noodle on yong kang my favorite beef noodle is this one https://goo.gl/maps/SUB9Lcmf2nM2. On the note of yong kang st, please tell me you got the spring onion pancake 葱花饼 right at the first crossing. 50NTD/piece and I am drooling thinking about them. How are you? May I ask you about the “Taipei Tea People” ? Do you think I could join you for some tea session if it will be before Feb 19, 2017? I will be leaving Taiwan. I got into real drinking tea here in Taipei about 6 month ago and since that I am looking for people to drink the tea with. Thanks in advance for the reply and sorry to bother you if the offer was only towards James. Yes, those Yiwu bricks are really pretty great for their price/age. No real alternative in the western market really.. I just finished filming an ep on them. The shopkeeper was kind enough to give me samples across a range of years including the 98 yiwu. Knowing what I know now, I definitely need to pay her another visit. A wealth of knowledge on your site. I am slowly working my way through it! Thank you for doing what you do!